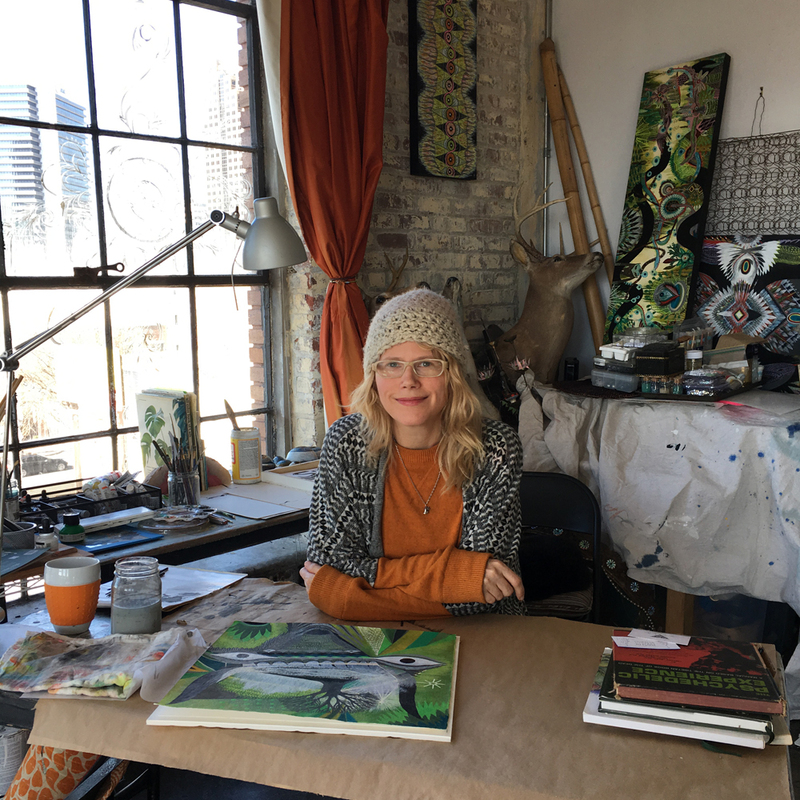 Birmingham-based artist Merrilee Challiss explores the complex layers of the natural world, illustrating the connections between its visible and invisible elements, the conscious and unconscious planes, and the realms in between. Merrilee’s work has recently been featured at the Julia Martin Gallery (Nashville), Hall-Barnett Gallery (New Orleans), AKA/PDX (Portland, OR), Lowe Mill (Huntsville), and locally at the Birmingham Public Library and the Birmingham Museum of Art’s SHIFT initiative. Her site-specific installation Eyes of Protection can be seen at the The Pizitz through July, with a portion of the proceeds from the sale of each eye donated to the Southern Poverty Law Center. Eyes are a recurring theme in your work. Can you tell us how that developed? Eyes have always been a part of my work.They have just been one of the symbols that have always shown up. To me, they represent an awareness of everything. I made the first ones with clay about four years ago. I started making things with clay, and I would just impress them in my hands. That sort of connection to how it would fit in my hand and how it was shaped by the natural shape of my hand, it ended up being eye-shaped. I didn’t start out thinking “Oh, I’m gonna make an eye.” I was going to make a pinch pot. Most of them started out by filling the negative space and relating to my hand in that way. As eyes started to show up in my work more and more, that evolved into the commission I did for Revelator Coffee. They wanted me to make a bunch of eyes, but I decided we should do a full moon of eyes. I kept using dots, so I thought I should just do them with sequins. For Eyes of Protection, the eyes are meticulously constructed with mostly sequins, and as most of the sequins were placed one at a time by hand, the work itself becomes a form of meditation. Each eye has its own inner eye – a mirror in the center – to extend the idea that these are pieces intended for meditation and reflection. Your return to making art full-time has been relatively recent. When that shift happened, did you find that your process had changed in any way? Pretty much everything changed. When I was running Bottletree, I was still making art and having shows, but I was interrupted by the realities of the day. I could have a day or two, or a good night a week, of focus. I didn’t have stretches of days to dive in a full way. I had not had that since being in graduate school. So that shift of attention and deeper focus manifested after Bottletree closed. I let go of one identify and reasserted that other identity – letting something die and then something grow in its place. It’s a process. It’s still going on, for sure. This whole process of evolution is also in my work. Nothing is done until I start seeing things in the things that I’m seeing. I put a lot of focus into round one. And then the next round, I’m not so concerned. In round three, which is the final round, but not the final round, I rein everything in. It’s kind of the balance between order and chaos, intention vs. accidents and surprise, not caring about the outcome and being more about process. Then I end up recycling and making work out of the work itself. Now, it’s not just a painting, it’s part of an installation of paintings. They are all relating and talking to each other and talking to the sculptures. There’s much more of a conversation happening now, where before it was much more stifled. I didn’t have the time to expand on those things. Do you have any new collaborative projects in the works? I have a couple of side projects. I’ll be teaching another workshop at Forstall Art Center. I’m doing some album art for bands. And I’m illustrating the memoirs of a scientist who has done seminal research on DMT, which is a naturally occurring compound in the pineal gland. It’s very daunting, but I am really excited about the challenge. I also want to illustrate a book or little zines about Birmingham’s historical artifacts and apocryphal tales. What do you find challenging about being an artist in Birmingham? I really miss Jessica Helfrecht, who ran Bare Hands Gallery. I feel like she was able to connect with collectors in a way that no one else in Birmingham has been able to do for me and my work. For someone like me, who is established, I am still under the radar for those kinds of collectors. It would be really great to see more art or a rotating selection at the new train station or site-specific things. Hopefully there will be more galleries in alternative spaces. Art Folk Gallery temporarily filled an empty space in the Young & Vann Building. It was an instance where the developer had an understanding of what the artistic community brings to an area. No, they don’t make as much money as if they rented it out, but they did make some money off the art that sold. They put on a number of really great shows. I’ve also had an idea for a cooperative and collective gallery. There are so many people and so much of a need that there would be a lot of people interested. It just takes one small group of people to start this. What do you think is special about being an artist in Birmingham? I feel grateful every day that I get to live in the Phoenix Lofts. I would not be able to afford to live in an apartment and then rent a separate studio. Light is important, and I can reconfigure based on what projects I am doing. I’m always making more space for the studio space. I do love living and working in Birmingham. I think there is powerful spiritual energy in Birmingham – historically, socially, geographically. There is such a hard energy, but it is very powerful. It’s something that is intangible. Birmingham is kind of a blank slate for me. It’s not so saturated. You can kind of be in your own world and your own space. I’ve never been starved. I can interact with city life, I can be in nature. There aren’t very many places where you can have such a high quality of life with such a low cost of living.